Can a television ever actually become art? We’ll leave it to a panel of bumbling academics at Pratt to decide for sure, but as far as we’re concerned, after laying eyes on the BeoVision 10, the answer is yes. Taking the same approach the Danish design firm took with the previous BeoVision 4 and BeoTime alarm clock, the new BeoVision 10 makes the bezel and surrounding finish as much a part of its attraction as the screen within. A colored cloth panel below the screen fills its rectangular profile in to create a perfect square, rimmed with milled aluminum, almost making the 40-inch LED-backlit LCD screen a footnote to its surroundings. Of course, the panel isn’t just for decoration, either. The cloth hides a full stereo system, including two 2-inch midrange drivers, ¾-inch tweeters, and a single four-inch center loudspeaker driver, all hidden. And should your choice of color wear thin after a few months, the panels are easily swappable between six different colors using a magnetic mount. Even more impressive, the entire television measures just 6.4 centimeters deep, and it mounts on a discrete arm that allows it to swing out from the wall up to 45 degrees for watching in different parts of a room. The BeoVision 10 has already gone on sale in the company’s native Denmark, where it sells for 43,495 Danish Kroner – about $8,767.29 USD (using today’s exchange rate). 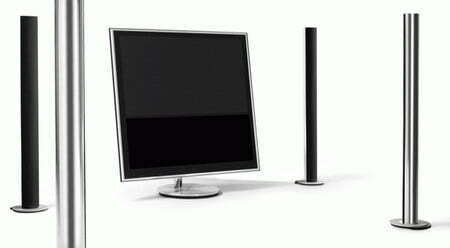 More details are available at Bang & Olufsen. Update: According to Bang & Olufsen PR, the BeoVision 10 should be priced under $8K U.S. when it is released sometimes in Q1 2010.